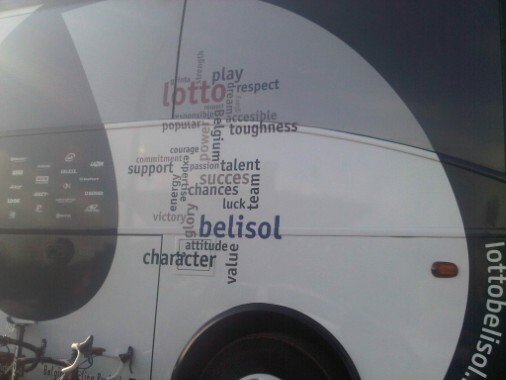 So yesterday I noticed a short story on Het Nieuwsblad, remarking upon how it was somewhat odd that the Belgian team would have their motivational buzzword chart-thing in English – “A strange finding on the bus of Lotto-Belisol.” This made me think about other such motivational words/phrases teams have used over the past two or three seasons, and I thought I would collect a few of them together. 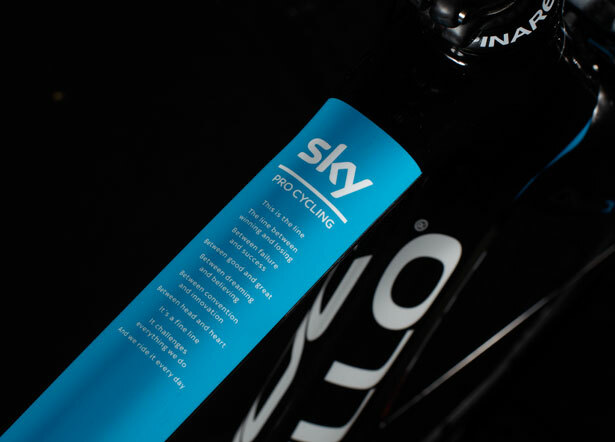 Probably the most well-known of these in the past few years is Team Sky’s ‘This is the line’ mantra printed on the top tubes of their Pinarellos. 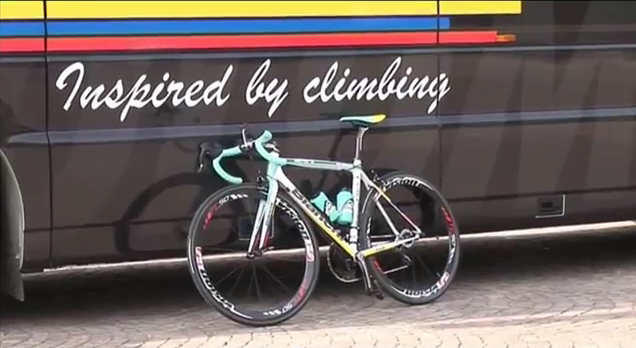 A lot of corny motivational stuff that the riders can glance down at now and then. I wonder if they look forward to Paris-Roubaix so they can tape their sector information lists over it. Next up is probably the best (or at least my favourite) example of a team motto/slogan of recent times. This year’s new Colombian ProContinental team Colombia-Coldeportes have adopted the slogan “Inspired by climbing” – apt for a team consisting of escarabajos. We’ve already seen Jarlinson Pantano do well at Strade Bianche, and we can expect them to be visible when the road goes up this season, maybe even at the Dauphiné or the Vuelta if they get the invites they have listed on their calendar. 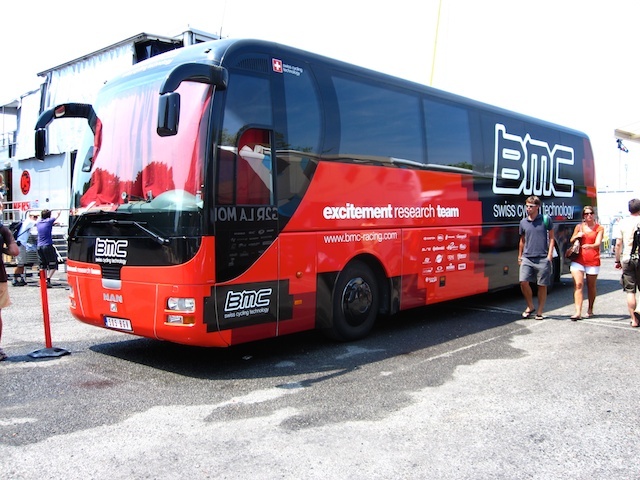 Last year’s team bus saw Team BMC attempt to raise some enthusiasm about the rather drab prospect of being merely a ‘research team’. Even adding the word “excitement” didn’t really succeed in making the phrase seem anything other than a corporate-style motto, though. However, the team’s results were anything but drab, with Cadel Evans picking up a slew of big stage race titles, including the big one. I didn’t see a lot of the other riders but I’m sure they picking up the slack in the research department. Maybe the big names BMC has brought in can add to the excitement and research this season. 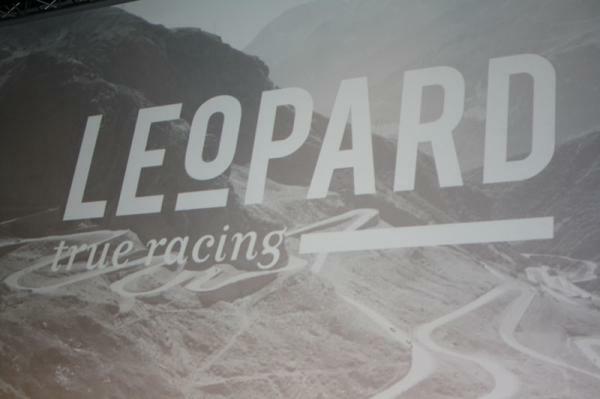 The short-lived Leopard-Trek team gave us the phrase “true racing”. It seemed a tad cringeworthy at the time, but not as embarrassing as the scarves and the pronunciation (Lay-o-pard). Anyway, the team actually did some ‘true racing’, appearing on the podium of every Monument (winning Lombardia), and even Andy Schleck dug into his rarely used suitcase of courage to take a memorable stage win up the Galibier in the Tour. The noble aim of Team Type 1 to raise awareness and “instill hope and inspiration in people around the world affected by diabetes” is reflected in their slogan, shown in a rather comical way below (they had €500,000 of equipment stolen though, so not that comical). The team has several riders who suffer from the illness, and last year won the Tour of Turkey with Alexander Efimkin, and had ambitions for a Giro d’Italia wildcard this year. New signings Julian El Fares and Daniele Colli have brought in some nice results at Tour du Haut Var and Giro della Provincia di Reggio Calabria already this year. Finally, we come to a new team in the WorldTour this year, the Australian squad GreenEdge lay claim to having “the edge in cycling”. Certainly they have already edged ahead of the competition in the discipline of the team time trial (hah! ), and Simon Gerrans has been edged out by Valverde a few times this year. I’m not sure what else I can say about this one, but with this team on the edge and Sky toeing the line, lets hope that both teams end the season safe and sound. Next Next post: What is Peter Sagan capable of?